Yes! I finished N’s socks BEFORE the first day of school! She then chose NOT to wear them…..ingrate! Oh well she wore them this morning, apparently she was ‘saving’ them to wear today…yeah yeah whatever. I’ve already cast on another pair but these ones are going to be knee socks. She’s lucky I’m addicted to knitting and her excitement of trying them on while knitting is enough to guarentee she’ll be kept in handmade socks until her feet fall off. 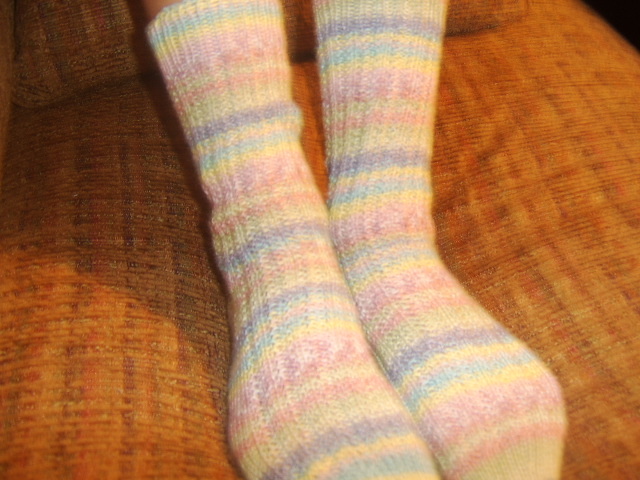 Pattern: More Sensational socks Seeded Ribbing with heel flap and short row toe.